The Earthquake Geology Disciplinary Committee promotes studies of the geologic record of the Southern California natural laboratory that advance SCEC science. Its primary focus is on the Late Quaternary record of faulting and ground motion, including data gathering in response to major earthquakes. Geologic observations provide important contributions, either directly or indirectly, to all six of the fundamental problems in earthquake physics identified in the SCEC4 proposal. Earthquake Geology also fosters research activities motivated by outstanding seismic hazard issues, understanding of the structural framework and earthquake history of special fault study areas (see Section 8, Problem 4), or will contribute significant information to the statewide Unified Structural Representation. Collaborative proposals that cut across disciplinary boundaries are encouraged. Gathering well-constrained slip-rates on the southern California fault system, with emphasis on major structures (Problem 1). Mapping and analysis of fault-zone properties where the seismogenic zone or brittle-ductile transition has been exhumed (Problems 1a, 3b). Paleoseismic documentation of earthquake ages and displacements, with emphasis on long paleoseismic histories, slip-per-event, and slip-rate histories, including a coordinated effort to develop slip rates and slip-per-event history of southern San Andreas fault system (Problem 2a, in collaboration with the SoSAFE focus group). Improve understanding of the architecture and tectonic activity of the Ventura and San Gorgonio Pass special fault study areas (Problem 4a), such as using B4 and other lidar data sets to better define fault traces, fault activity, and geologic structure. Improve the statewide community fault model in areas of inadequate fault representations or where new data is available, such as using high-resolution topographic data sets to better define fault traces, spatial uncertainty, and stochastic heterogeneity of fault geometry (Problem 4c). Quantifying along-strike variations in fault roughness, complexity, strain localization, and damage in relation to the rupture propagation processes, including evaluation of the likelihood of multi-fault ruptures (Problem 4b). Validation of ground motion prediction through analysis and dating of precariously balanced rocks and other fragile geomorphic features (Problem 6). Support integrative research and synthesis of results at the Ventura and San Gorgonio Pass special fault study areas. Requests for geochronology support should include a plan for timely completion of sample collection, processing, and analysis by the end of SCEC4. Earthquake Geology promotes studies of the geologic record of the Southern California natural laboratory that advance SCEC science. Its primary focus is on the Late Quaternary record of faulting and ground motion, including data gathering in response to major earthquakes. Figure 1. Carbon dating constrains transition from marsh facies to sand facies due to abrupt, likely coseismic inundation of Carpenteria Slough ca. 1,900 years before present. Figure 2. 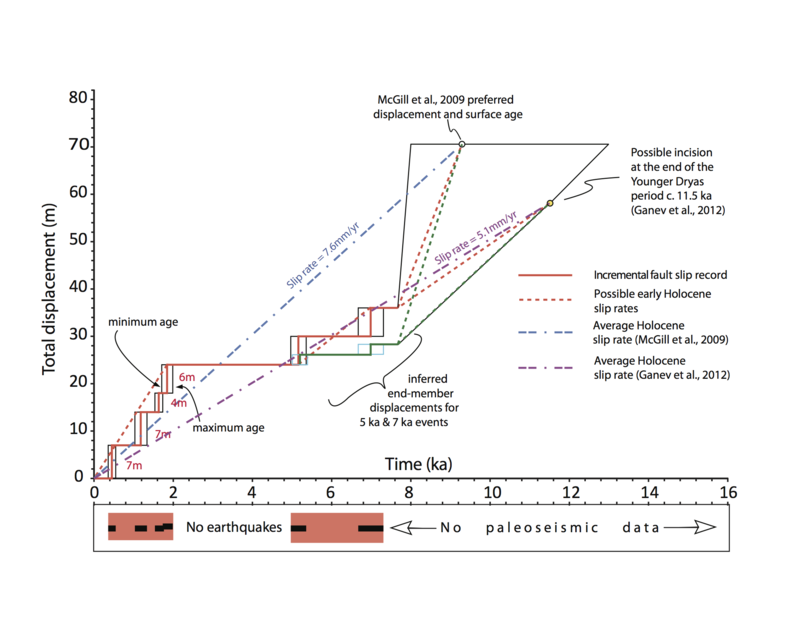 Slip rate and paleo-earthquake age data from the central Garlock Fault plotted versus time. Solid red line shows inferred incremental slip history of the central Garlock fault based on paleo-earthquake ages from Dawson et al. (2003), mapping of small geomorphic offsets by McGill and Sieh (1991), and Christmas Canyon West 1.9 ka slip rate (this study); thin, black vertical lines denote error ranges on paleo-earthquake ages. Suggested offsets in the ca. 5 ka and 7 ka earthquakes are based on range of possible offsets from 2 to 6 m based range of small offsets measured by McGill in Sieh (1991). Dashed purple line shows latest Pleistocene-Holocene slip rate of Ganev et al. (2012) based on their model of incision beginning at end of Younger Dryas period 11.5 ka. Dashed blue line shows preferred slip rate from McGill et al. (2009); solid horizontal black line shows possible age range of offset channel used in their rate calculation. Short-dashed green and red liens show possible early Holocene slip rates that would be required to explain both well-constrained the mid- to late Holocene incremental slip record and the longer-term rates of McGill et al. (2009) and Ganev et al. (2012). 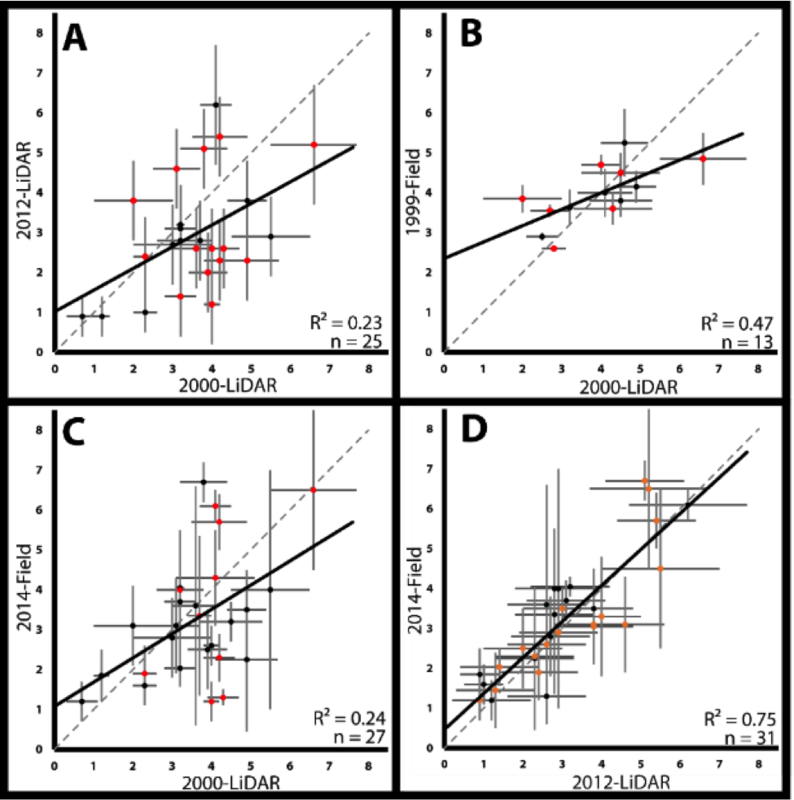 Lower panel shows age ranges of paleo-earthquakes from Dawson et al. (2003) El Paso Peaks trench site. Figure 3. Comparison of four different datasets of co-located offset measurements within the maximum slip zone of the Hector Mine surface rupture. Of the six possible combinations only the four which yield n > 10 are plotted. A 1:1 line is plotted as dashed gray line, and a linear regression and associated R-squared is shown. Data is colored based on subjective quality rating (orange or red = poor or fair, black = good or very good) assigned during 2014 fieldwork (A,B,C) or to 2012-LiDAR measurement (D). A self-consistent picture has emerged from the Ventura SFSA project of large, tsunamigenic earthquakes spanning several faults of the Ventura-Santa Barbara basin. Slip events exceeding 5 meters, and perhaps as much as 10 meters, are required to explain geomorphic evidence for coseismic emergence of the coastline (Rockwell et al., in preparation) and formation of fold scarps east of Ventura (Grenader et al., this meeting). Because the western half of this fault system underlies the Santa Barbara channel, large slip events are expected to produce damaging tsunamis (Ward, 2014 SCEC report). The Oxnard Plain, located downthrown side of the fault, is expected to receive the worst inundation, while little runup occurs on the fault hanging wall near Ventura. Carpenteria Slough, located towards the western end of the Ventura Anticline, would undergo an intermediate level of subsidence, and appears to be well situated to record earthquake-induced subsidence and tsunami events. New results from Simms, Rockwell, et al. (2014 SCEC report, and this meeting) show evidence for three inundation events here since 4.1 ka — a result consistent with the record of emergence of the coastline near the anticline crest. Within the deep Santa Barbara basin, distinct layers of reworked marine sediment may indicate coseismic disturbance and submarine landslides (Berelson et al., 2014 SCEC report and this meeting), though not necessarily triggered by earthquakes on the Ventura-Pitas Point fault. Geochronology advances supported under SCEC4 continue to yield new and more precise slip-rate data for the southern California fault system. A workshop convened in last October brought together geologists and geochronologists in a productive discussion of emerging techniques in exposure and luminescence dating. One of the highlights of SCEC geochronology has been the development of the pIR-IRSL technique on K-feldspar (Roder et al., 2012). Application of this technique to alluvial fan offsets along the Garlock fault yields a new, short term rate of 12.8 +/- 2.4 mm/yr that encompasses a cluster of four earthquakes between 500 and 1900 years ago (Dolan et al., in review). This is double the Holocene average rate of 6 mm/yr, and well in excess of the current loading rate of the Garlock fault inferred from geodesy. Overall, it appears that loading and strain release on the Garlock fault are temporally clustered, probably in alternation with right-lateral slip through the Eastern California Shear Zone. Newly collected lidar data from the Agua Blanca fault, northern Baja California, reveals several slip-rate sites in new detail (Behr et al., 2014 SCEC report). Pending geochronometry of these sites will reveal important information on how much plate-boundary strain is transferred to the California borderland, as well better understanding of seismic hazard for northern Baja California. Slip rate of the Sierra Madre fault, located on the margin of the Los Angeles basin, and the Wheeler Ridge blind thrust, southern San Joaquin Valley, are also being revisited with lidar data and modern geochronology approaches (Hanson et al., this meeting; Kleber et al., this meeting). Results from the eastern California shear zone reveal new insight into the balance of fault slip and distributed deformation of the surrounding rock volume. Reanalysis of coseismic slip from the 1992 Lander earthquake (Milliner et al., this meeting) and the 1999 Hector Mine earthquake (Stock, et al., 2014 SCEC report; Witksoky et al., this meeting) confirm sharp, along-strike slip gradients near 10^-3 (1m in 0.5 km), and suggest that fault slip distributions could be fractal rather than smoothly elliptical. New fault slip rate data from the Calico fault and Harper Lake fault are consistent with slip transfer between these structures via linking reverse faults, as well as substantial off-fault deformation in zones of uplift and towards strike-slip fault terminations. Overall, as much as 40% of the deformation budget across the northern Mojave Desert may be absorbed in a distributed manner (Oskin, Cooke et al., 2014 SCEC report).